I'm trying to communicate with rc522 chip with the use of this code, I only modified the SPI calls to use the HAL libraries and initialized SPI with HAL libraries. Kept all other functions intact. Now the image below is what I captured with my logic analyzer and I really just have no idea what am I doing wrong. To my newb eye, my SPI communication looks okay. The chip however, is not really returning anything and I am getting 0xFF everytime (I also captured that with my logic analyzer while rc522 was connected to my STM32F7Discovery). Does anyone have any idea why my chip would not be responding at all? I am connecting the reset pin of my board directly to RFID-RC522 reset pin. I also tried the chip with miguel balboa's library for arduino and it works just fine there. After I push the reset pushbutton on my board, the first two values aren't even decoded by the analyzer's software. If I look at what the library is supposed to be sending out for reset is 0x01<<1, so 0x02 as the reg_command address, then 0x0f as pcd reset command. Why would it differ? As you can see my chip select goes low during reset and it's still low when the communication starts, even though I put a pullup on it. Data bytes on both MOSI and MISO lines are sent with the MSB first. Data on both MOSI and MISO lines must be stable on the rising edge of the clock and can be changed on the falling edge. Data is provided by the MFRC522 on the falling clock edge and is stable during the rising clock edge. Also from this paragraph, which is the only one describing these values, I cannot decipher what the base value of the clock should be. High or low? Your suspicion seems to be correct and your SPI clock settings are incorrect. It can be observed in the logic analyzer's image that the data changes on rising edge and stable on the falling edge. 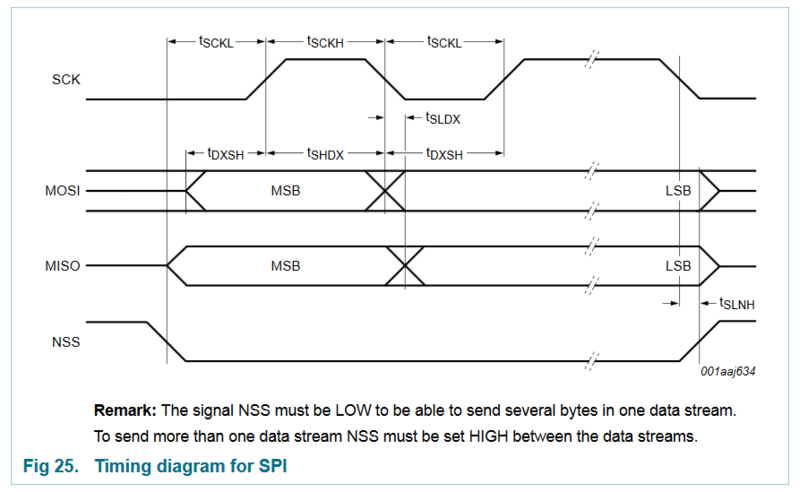 If you check the SPI timing diagram in the datasheet of the RC522. You can see that the clock is LOW before the communication, the data is sampled on the rising edge and the data changes on the falling edge. 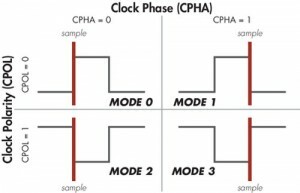 For you CPHA setting: SpiHandle.Init.CLKPhase = SPI_PHASE_1EDGE; is correct, on the timing diagram the data is sampled on the first clock transition. But it should be a rising edge and not a falling. For CPOL your setting is idle HIGH while on the timing diagram it is idle LOW. If you observe that if your clock signal would be negated then the first clock transition would be a rising edge while the data is stable and the data would change on falling edge. You can also go with trial and error because you have a maximum 4 types of clock and the logic analyzer to check the signals. Not the answer you're looking for? Browse other questions tagged microcontroller stm32 spi stm32f7 mfrc522 or ask your own question. How to interface two wire & three wire SPI device? How SPI and I2C latch data?